Lee’s Summit, Missouri is a suburb of Kansas City and boasts an ideal location that makes it easy for residents to enjoy all of the top-notch shopping and dining options of the Kansas City Metro area. Because of its wonderful location, Lee’s Summit continues to be a popular destination for prospective homebuyers looking to relocate in the “Show Me State.” Buy a home in Lee’s Summit and experience the best of both worlds, a charming hometown and convenient access to the big city and all of its exciting attractions. 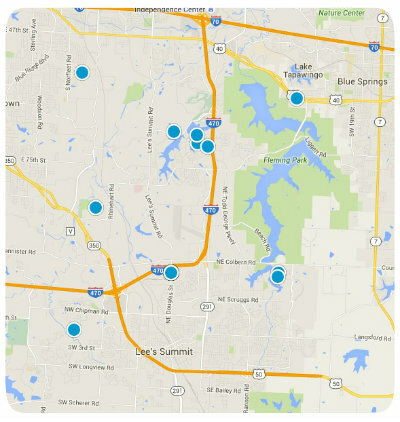 Homes for sale in Lee’s Summit are found in diverse and impressive neighborhoods. Foxberry Estates is one such neighborhood. Foxberry Estates is comprised of single family homes ranging in size from 1,774 to 2,800 square feet. Typically homes in Foxberry Estates have between three and five bedrooms and two to four bathrooms. Homes in Foxberry Estates typically range in price from around $260,000 to $300,000. Foxberry Estates is a Summit exclusive community located along Missouri Highway 7, south of Lake Lotawana and U.S. 50. This remarkable neighborhood features a spectacular 4,800 square foot clubhouse and a top-notch lap pool with a mushroom top sprayer over its adjoining zero-entry shallow entrance. Buy a home in Foxberry Estates and you’ll be just minutes from the fishing, hiking and boating amenities of Lake Jacomo, Fleming Park and Blue Springs Lake. In addition to all of that, Foxberry Estates is less than 20 minutes from three excellent golf courses. If you would like to buy a home Foxberry Estates of Lee’s Summit, Missouri, or if you have questions regarding homes for sale in other Lee’s Summit communities, please do not hesitate to contact us today for more information. Listing courtesy of Pete Kenney of ReeceNichols Lees Summit. Listing courtesy of Eric Savaiinaea of United Real Estate Kansas City. Listing courtesy of Kayla Shepard of Chartwell Realty LLC.